You may not know this but besides cooking, I love sports. I know it isn’t everyone’s jam, but we are in prime Superbowl time. So, with that in mind, I thought I would dedicate a couple of posts to some super quick and easy game day dishes that are sure to please any palate. My philosophy on game day food is well, simple. If it can’t be done with ease and doesn’t leave you time to enjoy the game then forget it. One of the most important items to have on your game day menu is an amazing condiment. I’m not talking about your run of the mill ketchup, mustard, or anything like that. Although, they all have their place, but that is another post all together. No, I’m talking about reaching into your fridge for a homemade jar of ranch dressing. Seriously, there isn’t anything better than that for a number of reasons. Those reasons include; you control the ingredients, you know what is going into the ranch, where it was made, and finally the satisfaction of knowing that you made it happen. Most importantly, you have made it for less than what it would cost to drive to the store and actually buy a bottle of ranch. How awesome is that?! I know, hold your applause. Also, I would be willing to bet that you have most of these ingredients around the house already. Ready to rock the Ranch? Alright, let’s do this! This recipe has been adapted by me. To see the full recipe, please click here. In a medium bowl, add the yogurt and combine the rest of the ingredients. Adjust seasoning as needed. If you can believe it, that is it!! This is perfect for wings, veggies, salad, nachos, and the list goes on. There is a celebrity chef who says he hates single function kitchen tools. You know what? I agree! That is why you can use this ranch on just about anything! Pretty functional, right? 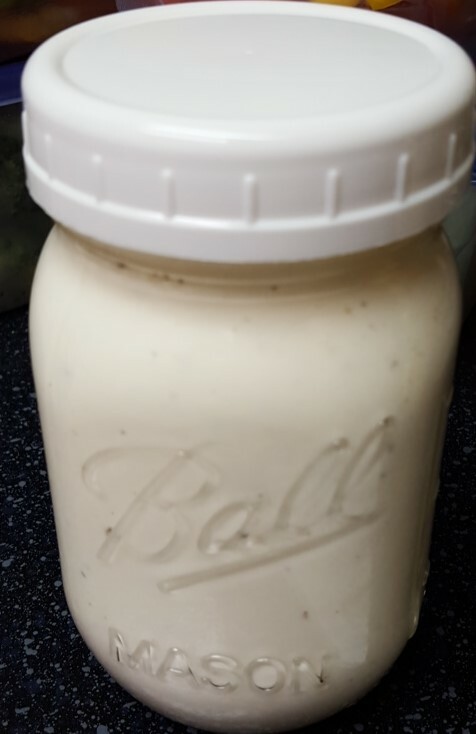 I love the profile of this ranch dressing. It is a little more tangy than what most people think of when it comes to ranch. Also, I find there is some additional complexity as you can taste each ingredient too. I did find that I needed to adjust the seasoning when I was done. I adjusted salt, pepper, and I added a little more garlic powder as well. Remember to taste! Last piece of the puzzle for me is to talk about about the yogurt. If you decide to use plain yogurt as the original recipe suggests, place it in a strainer and place the strainer over a bowl. Let the yogurt drain and thicken for 20 minutes. You can line the strainer with a paper towel to help absorb more water. For me, greek yogurt wins every time. It adds some much needed body to the ranch and that is important. Plus, you don’t have to fuss with straining it out. You add, season, stir, season again, and you are finished. You can’t beat that any day in my opinion. There you are! Perfect for your game day grub! Stay tuned because I will be doing another post on a must have for your game day menu! Trust me, you won’t be disappointed. As always, feel free to comment on the recipe or send me an email and let me know what you think. Enjoy!